Water is a powerful and persistent force. 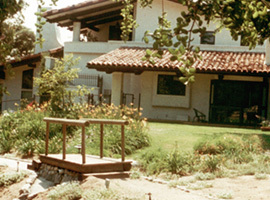 As interested observers of foundation distress over the past five decades, we have found that most foundations and hillside problems are either caused by or aggravated by water. Here’s why. Some dry clay soil particles can expand twenty or more diameters when they become wet. 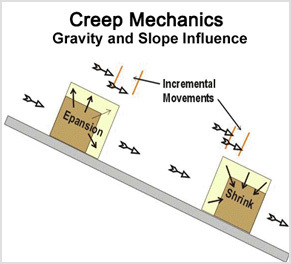 On a sloping site, a unit of clay will expand downhill as gravity inhibits uphill expansion, as shown in the example above. When the same unit of soil dries, it contracts in the downhill direction, because gravity inhibits uphill contraction. The net result then, is a downhill creep and a sagging floor. Too much water makes mud. We know mud has less bearing capacity than dryer soil. We walk on average soil without sinking. On mud our weight displaces the soil and we sink. We should expect a similar experience with the footer of a foundation accompanied by standing water saturating the perimeter soil. 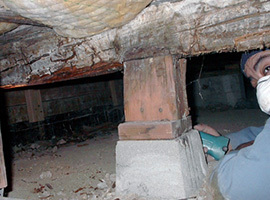 The foundation will sink at a different rate in different areas, affecting the floor adjustment. If your house is built on a hill or even a slight grade, you probably have cripple walls. Cripple walls should be braced with plywood for improved safety.